Launched in support of the UK's leading maritime charity in 2005, every year we make a donation per barrel to Seafarers UK. This year's donation of £38,676 took place at the opening of The Admiralty in Trafalgar Square, London. 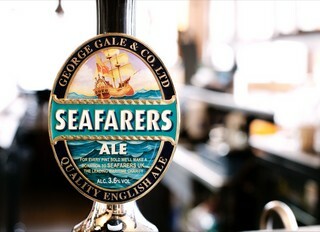 Over 6,000 barrels of Seafarers Ale were sold last year, with a donation of £5 per barrel adding up to the total amount. Charity Director General Barry Bryant met with guest of honour, The Admiral Lord West of Spithead, himself a long term supporter of the organisation, as well as Fuller's Chief Executive Simon Emeny, and Sales Director Richard Fuller. "It is a real pleasure to be able to see such a worthwhile charity receiving generous and constant support."